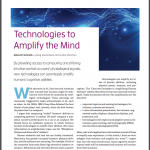 If you are interested in doing a thesis in the context of human augmentation and amplification of human sense, please first reads “Technologies to Amplify the Mind” . This paper addresses the overall research question : how can we enhance human abilities through digital technologies outlines this vision of amplifying the human mind through digital technologies. You should also read the scientific context page. We hope this gets you even more excited on the topic. Please write down some questions and concerns you have with this research domain. Then think of novel prototypes and ideas you would like to work and contact us. Develop models, concepts, components, and platforms that will enable and ease the creation of interactive systems that measurably increase human perceptual capabilities. This website is the official portal for “Amplify” project. The project received funding from the European Research Council (ERC) under the European Union’s Horizon 2020 research and innovation programme (ERC Consolidator Grant no.683008). The project runs from 2016-07-01 to 2021-06-30.